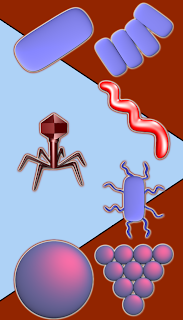 Icons of Coccus, Spirochete and Bacilus. "Basic building stone" of Bacteria. Threateningly looking icons of virus. Salmonellatyphi, Staphylococci and Palisades complete this set. I apologize, if the design of Bacteria isn't accurate, but I am nonspecialist in this branch. Icons were made on request.